Despite having never won a major, Steve Stricker has still been able to make bank with career earnings which as of 2018, was said to be well over $40 million. The one-time world number two golfer, who has spent more than 250 weeks in his career with a top-10 ranking, is also a two-time PGA Tour Comeback Player of the Year who has represented the United States at several Ryder Cup and Presidents Cup tournaments. Stricker was born Steven Charles Stricker on the 23rd of February, 1967 in Edgerton, Wisconsin. He attended Edgerton High School during the time which he began learning to play the game of golf at Lake Ripley Country Club and Edgerton Towne Country Club. After completing his high school education, Stricker enrolled at the University of Illinois where he was a part of the Illini golf team. He earned All-American honors in 1988 and 1989 before graduating a year later and turning pro. Steve Stricker began his golf playing career on the Canadian Professional Golf Tour where he managed two tournament victories. By 1994, he joined the PGA Tour but it took two years before he was able to taste victory first at the Kemper Open in May 1996 and then at the Motorola Western Open in July that same year. He further added seven top ten finishes at other tournaments that year to place fourth on the 1996 PGA Tour money list. In 1998, Stricker came close to winning his first major but only managed a runner-up position to veteran Vijay Singh. His next best outing came at the 1999 U.S. Open where he managed a fifth-place finish. Stricker was able to enjoy victory again in 2001 at the WGC Match Play Championship where he took home $1 million in prize money. This victory turned out to be Stricker’s last in a long time as he suffered a very bad run of form that cost him his tour card in 2004. 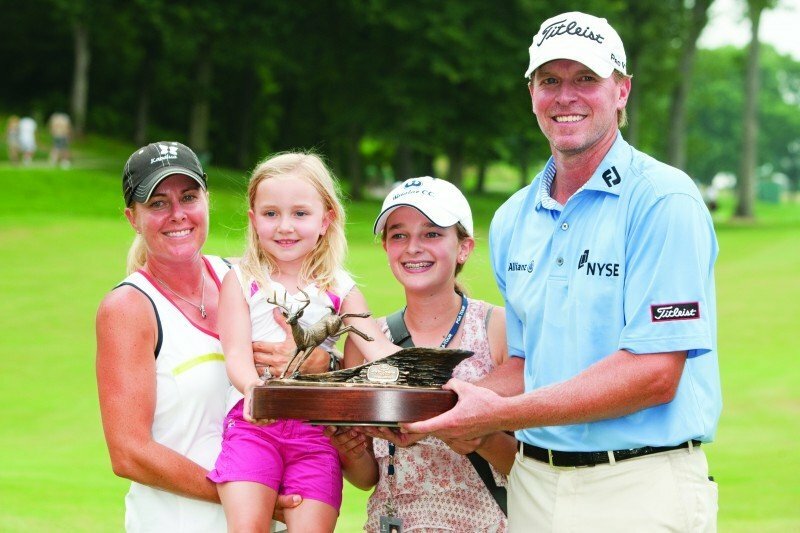 By 2006, however, Steve Stricker was able to regain his place on the tour as he went on to manage seven top-ten finishes. The following year, he won The Barclays tournament and was subsequently placed No 4 in the world rankings. Stricker began 2008 by finishing as runner-up at the Mercedes Benz Championship. His next victory, however, came a year later in 2009 at the Crowne Plaza Invitational at Colonial. That victory seemed to have spurred him on as he bagged wins at the John Deere Classic a few months later and at the Deutsche Bank Championship that same year. He subsequently achieved a career-best No 2 spot on the Official World Golf Ranking. Stricker won his eighth and ninth tournaments in 2010 at the Northern Trust Open and the John Deere Classic. In 2011, he claimed victory again at the John Deere Classic after winning the Memorial Tournament in Ohio before that. Steve Stricker is married to his college sweetheart, Nicki Stricker, who is the daughter of retired professional golfer Dennis Tiziani. Tiziani famously won the Wisconsin PGA Championship on four occasions before becoming a coach. He took up the head coach role for the men’s golf team at the University of Wisconsin while he also taught his son, professional golfer Mario Tiziani and future son-in-law Stricker the ropes of the game. A few years after Stricker became a professional, he married his coach’s daughter in 1993. The couple’s love was evident for everybody to see as she began working as her husband’s caddie in order to stay close to him while he was playing. She also did so in order to have the opportunity to travel with him to all his tournaments. She held the role for five years until she got pregnant with their first child. They have since that time grown to become a family of four people as Nicki continues to occasionally take up the role of caddie for her husband. Steve Stricker is 6 feet 0 inches or 1.83 m tall with a weight of 190 pounds or 86 kg. He was voted the PGA Tour’s Comeback Player of the Year in 2006 after losing his card two years before that. He earned the title again in 2007 after breaking into the top 5 of the Official World Golf Ranking list. Stricker managed three straight victories at the John Deere Classic to become just the tenth golfer since World War II to achieve such a feat.